Spring is full of surprises so far—sunny days, balmy temps and plenty to keep you busy until summer comes. 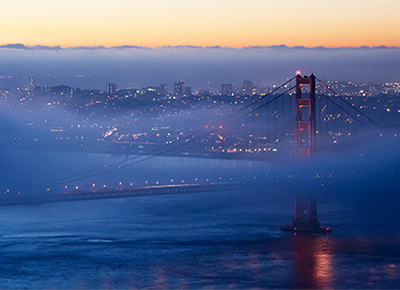 So instead of binge watching Shark Tank, get out and experience the city before Karl the Fog rolls back into town. We dug up 22 restaurants, events and shows to fill our calendar with all kinds of culture for the next three months. Sampling a vast selection of ciders while taking in views of the Golden Gate Bridge? Count us in. 1. Presidio Picnic, hosted by the Presidio Trust and Off the Grid, has returned in time for spring. That means every Sunday you have a solid reason to eat and drink on the lawn, all while the kids play in the background. 2. Sample from a selection of 200 ciders—ranging from local favorites like Sonoma Cider to international classics like Worley’s Cider from England—at Cider Summit on April 22. 3. Not that we need an excuse to head to wine country, but the Calistoga Food & Wine event on April 21 and 22 is pretty good incentive to head north. This year there’s a winemaker dinner in the cave at Fairwinds Estate and a grand tasting at Solage—with small bites, live cooking stations and, of course, plenty of wine. 4. Miami meets Cuba in San Francisco at the newly opened Media Noche in the Mission. Don’t leave without ordering a, duh, media noche, a pressed Cuban sandwich with ham, pork, Swiss cheese, pickles and mustard. The ceviche with plantain chips is our second fave. 5. San Francisco’s Jewish Community Center recently launched a food series called Table Talk that delves into the histories of the cultures that have left a lasting mark on the Bay Area’s culinary scene. Next up: Explore the Filipino food movement on May 16. 6. By now we’re hoping the snaking lines have died down at The Halal Guys in the Tenderloin. The famous NYC food cart’s first outpost on the West Coast serves up gyros and plates piled high with meat, but the sauces are the standouts here. The spicy red will set your mouth on fire, so chase it with the creamy white sauce for a killer combo. 7. Beloved local brewers finally have a brick-and-mortar with Almanac Taproom, where you can wash down a juicy burger with a pint of farmhouse saison. 8. Get yourself a sweet scoop of pistachio with Maldon sea salt at the new sherbet-hued Coletta Gelato in SoMa. The silky, sweet gelato is made and pasteurized on site for the best texture and freshness. On sunny days, look out for the Coletta Cruiser, a bike stand peddling a rotation of flavors around town. 9. Eat and drink your way through the 10th annual Taste of the Nation (March 23), where restaurants like Flour + Water and Aatxe will serve up small bites and bartenders will mix up handcrafted cocktails—all in support of Share Our Strength's "No Kid Hungry" campaign. 10. This year, Napa Valley towns celebrate Arts in April with a month-long roster of events for anyone who loves both art and wine. Sign up for a tour of Hall Wines’ prestigious contemporary art collection or check out a storytelling speakeasy at Calistoga’s Tank Garage Winery. 11. You can still get your art on in Marin even while the Headlands Center for the Arts is closed for construction, through a series of special off-sites. We’ve got our eyes on one event that coincides with the San Francisco International Film Festival: Bonnie Prince Billy and Bitchin Bajas will perform a live score to Bay Area artist Jerome Hiler’s experimental films (April 10). 12. It's not every day that you can wander about the fields among olive trees just a stone's throw from San Francisco. But now, McEvoy Ranch is open for visits by appointment. Book yourself in for a wine- and olive-oil tasting, a walkabout in the fields or a ranch tour (the next one is on May 27) for an inside look at McEvoy's special olive presses. 13. We’ve always eyeballed the unique pieces behind the counters at SFMOMA’s museum store. Now you can meet the designers in person at a Jewelry Trunk Show on April 29…and shop their beautiful baubles, of course. 14. Caitlyn Jenner opens up about her very public transition and the challenges facing today’s transgender community. Come prepared for a timely and important conversation at the Commonwealth Club on May 3. 15. Lest we get too serious, there’s also a live broadcast of Kamau Right Now!, W. Kamau Bell’s radio show that talks about politics, socioeconomics and race—and somehow makes it all hilarious (March 23). 16. It’s the 50th anniversary of the Summer of Love, and the de Young is pulling out all the stops. The visual journey through 1960s counterculture (through August 20) features psychedelic rock posters, trippy light shows befitting the Grateful Dead and tie-dye designs by queen of counter couture Birgitta Bjerke. 17. “Hippie Modernism” at the Berkeley Art Museum and Pacific Film Archive (through May 21) goes one step further to look at the art, architecture and design of the 1960s and how the rich counterculture produced in this era hinted at the tech revolution and eco-consciousness to come. 18. We’re all familiar with photographer Diane Arbus’s haunting portrait of the twins from 1967, but shows to date have had little focus on the first half of her career. This exhibit at SFMOMA (through April 30) does just that, highlighting work from 1956 to 1962, and perhaps providing more context and understanding of what was yet to come. 19. Spring is all about dance: First, you’ve got Bay Area Dance Week (April 21 to 30), where you can watch everything from hip-hop and break dancing to traditional Indian dance. Next up is Alonzo King Lines Ballet’s spring season (May 4 to 14), which will be performed to a backdrop of poetry and spoken word. And finally, there’s “The Right to Be Believed” (May 25 to 27 and June 1 to 3), a site-specific performance that explores issues of women’s credibility through the lens of the famous Anita Hill case. 20. On May 4, Sheryl Sandberg leans in to talk about the sudden death of her husband and how she learned to carry on. 21. For the San Francisco Art Institute’s Disruptor Gala (April 29), 12 alumni have designed and built stunning site-specific bars and lounges at the Russian Hill campus. Think glow-in-the-dark drinks, a peace bar commemorating the Summer of Love and a monumental installation by Burning Man artist David Best. If the $350 ticket price seems daunting, check out the after-party instead (only $85). 22. The public is welcome to Wikipedia’s Art + Feminism Edit-A-Thon on March 25, where you’ll help improve the online encyclopedia’s content about women artists. And not to worry, no editing experience is required. The future (of Wikipedia) is female.